The first CD released by the Polish Music Association was the disc Poniatowski Rediscovered, the première of which took place during the inauguration of the 6th Festival of Polish Music in November 2010. The disc contains unique recordings of unknown opera arias by Józef Michał Ksawery Poniatowski (1814–1883), a composer unjustly forgotten whose works are masterpieces of Polish bel canto. The compositions presented on the disc are in the rendition of two superb Polish musicians: Aleksandra Buczek (soprano) and Grzegorz Biegas (piano). Also included with the disc is a booklet containing detailed information concerning the biography of Józef Michał Ksawery Poniatowski, as well as a Polish translation of all of the arias on the CD. After 150 years since its Paris première, Józef Michał Ksawery Poniatowski's opera Pierre de Médicis has been heard for the first time. Its contemporary première took place on 23 July 2011 during the 7th Festival of Polish Music. Invited to take part in this extraordinary project were distinguished performers from Poland and abroad. Among them were: Aleksandra Buczek, Xu Chang, Florian Sempey. Yasushi Hirano and superb Italian conductor Massimiliano Caldi, who prepared and led the bel canto master's work. A year after this event, the Polish Music Assocition decided to release a CD with this unique work. On the disc are highlights of Poniatowski's opera, which were recorded during the 7th edition of the Festival. 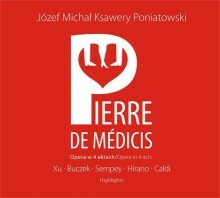 The disc with Prince J. M. K. Poniatowski's opera Pierre de Médicis was on 15th of July 2012! Ma­my przy­jem­ność za­pre­zen­to­wać ko­lej­ne wy­daw­nic­two, któ­re uka­za­ło się na­kła­dem Sto­wa­rzy­sze­nia Mu­zy­ki Pol­skiej. Na trze­ciej z ko­lei pły­cie zo­sta­ły utrwa­lo­ne zna­ko­mi­te in­ter­pre­ta­cje pie­śni Mie­czy­sła­wa Kar­ło­wi­cza oraz cykl „Ry­my dzie­cię­ce" Ka­ro­la Szy­ma­now­skie­go w wy­ko­na­niu dwoj­ga wy­bit­nych mu­zy­ków – so­pra­nist­ki Elż­bie­ty Szmyt­ki oraz pia­ni­sty Le­ven­te Ken­de. Al­bum, na­gra­ny pod­czas kwiet­nio­wej se­sji w stu­diu Ra­dia Kra­ków, sta­no­wi wspo­mnie­nie wy­stę­pu oboj­ga ar­ty­stów w ra­mach 8. Fe­sti­wa­lu Mu­zy­ki Pol­skiej. 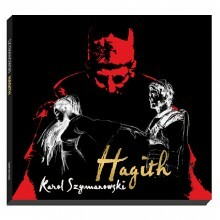 Association of Polish Music recorded Szymanowski's Hagith on July 12th and 13th during 9th Festival of Polish Music in Cracow. 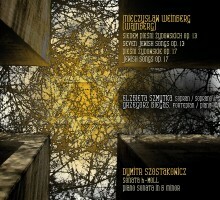 CD has been released in cooproduction of Ars Operae Agency and Association of Polish Music. There we can find songs of famous 19th century polish composer - Stanislaw Moniuszko. His melodies are known all over the world. It is performed by Elżbieta Szmytka - soprano who has been performing at Europe's most important opera houses and well-known hungarian pianist Levente Kende. CD has been recorded at PSM II st. studio in Kraków between August 21st and 24h 2014. Ars Operae Agency and the Association of Polish Music published in the next mutual project the works of 20th-century artists: Mieczysław Weinberg (Wajnberg) and Dmitri Shostakovich. The main target was to present the wider audience the compositions of Weinberg (Wajnberg), an important artist, though forgotten. Recently, an increase in interest in the composer's work, reflects in the multiplicity of his works throughout the world. CD was prepared as a compilation of songs from the Second World War - songs by Weinberg (Wajnberg) op. 13 and op. 17 for soprano accompanied by piano and 2nd piano sonata by Shostakowich performed by outstanding artists: soprano Elżbieta Szmytka and pianist Grzegorz Biegas. The next CD released by Ars Operae Agency and Association of Polish Music are the works of J. M. K. Poniatowski presenting arias from his most important operas: Don Desiderio, Gelmina, L'Aventurier, La Contessina, La Sonnambula and Pierre de Medicis performed by orchestra. So far, arias were recorded only in the version for solo voice accompanied by piano. New edition is orchestrated by Mateusz Walach, an experienced arranger, graduate of the opera-symphonic conducting in Katowice, in the class of Szymon Bywalec. Cast: Joanna Woś – soprano called by press 'the best Polish belcanto singer', The Polish National Radio Symphony Orchestra and Bassem Akiki – a praised conductor of the young generation. 9. 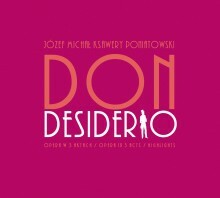 "Jam jest dudka Jezusa mojego"
Poniatowski wrote opera Don Desiderio at the of age 24 and its premiere took place in 1840 in Pisa. It is, out of 12 of his operas, the most successful piece. The music reminiscent of Donizetti's and Rossini's operas buffa, being equally melodious, sophisticated and full of humour. The Polish premiere took place at the Municipal Theatre in Lviv in 1878, and its contemporary performance was presented in Krakow during the Festival of Polish Music in 2016, where performed: Stanislav Kuflyuk, Joanna Woś, Ondrej Šaling, Krzysztof Szumański, Vera Baniewicz, Sebastian Szumski, Wojciech Parchem, Choir of Karol Szymanowski Philharmonic in Kraków and Polish Sinfonia Iuventus Orchestra under baton of Krzysztof Słowiński. Co-funded by the Ministry of Culture and National Heritage.